A mid-late maturing variety, Onion Red Baron has flattish-round bulbs of a beautiful dark red colour. 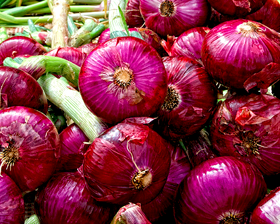 Onion Red Baron is an excellent cropper producing attractive, firm well flavoured bulbs which keep well. Sow seeds from late spring. A rich firm, well drained soil in full sun is required. Sow seeds thinly when the soil surface is dry and workable, 1cm deep in drills 30cm apart after raking to a fine tilth.